Set in feudal Japan, the story of Kyurinaga’s Revenge is a cross between veggie tales and ninja warrior. The story follows Kaoru Tamanegi, a katana-wielding onion estranged from his prominent shogun clan, and Broccoli Joe, an ordinary street broccoli with a knack for shooting kunais, on their quest to defeat the evil cucumber, Kyurinaga and his overpowering shogunate. Well, at least that’s what I think Kyurinaga’s Revenge is about. The story is underdeveloped and seems rushed. While I understand Yasai Ninja, RECO Technology’s previous installation, does provide some of the story, I wish more of the background, adventure details, and mission was incorporated at the start of this game and during cut-scenes. Most of the time I was running around, dodging attacks by killer vegetables and avoiding being touched by ghost vegetables, with no idea why I was doing what I was doing. Why is Kyurinaga seeking revenge? What is my end goal? And why are these vegetables attacking me? The only reason I was even able to come up with a synopsis of the storyline was because I used coins to purchase unlockables, which provided backgrounds on each character. Other than these unlockables, the story is not developed during gameplay and further depreciates the characters, conflict, adventure, and ultimately the playability. RECO Technology created an interesting idea by making the characters vegetables. However, this concept isn’t carried out thoroughly. Yes, the characters are vegetables, but that seems to be the only link to the vegetable theme. Everything else about them and their mission seems innately human. Like why do the vegetables need sushi to survive? I also wish there was better character development. While I love the great artwork and creativity that went into each character, they need more personality and diversity. The onion and broccoli rag on each other during cut-scenes, which creates some humor, but it is hard to understand exactly what they are talking about without knowledge of their backgrounds. Also, the villains and enemies are introduced very quickly without any explanation as to who they are, or why they are trying to annihilate you. You just simply have to run. While the story was a struggle to understand, the level design and playability make the game enjoyable. Kyurinaga’s Revenge is designed with different types of levels that include platforming, puzzles, and combat modes. 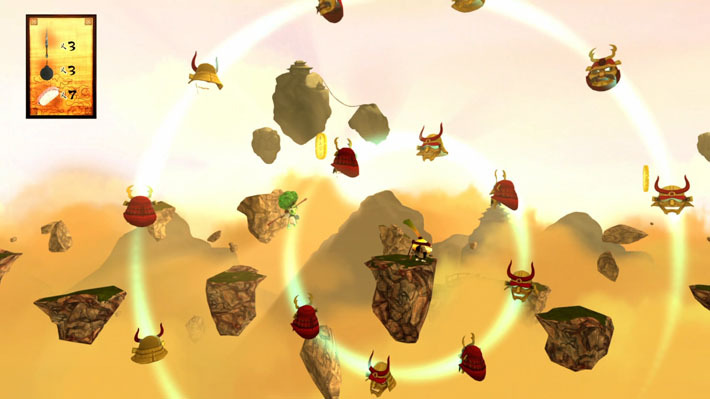 The best-designed and most enjoyable part of the battle against Kyurinaga is the platform levels. Filled with intriguing puzzles that require perfect timing and planning to complete, RECO Technology created elegantly designed 2D levels that cleverly increase in difficulty. 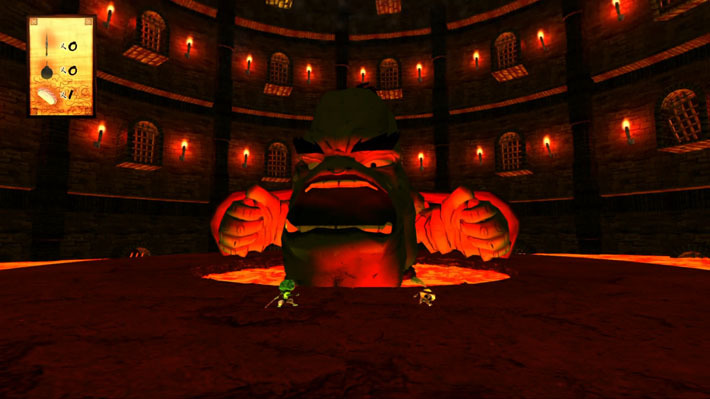 The graphics aren’t perfect as sometimes it was hard to tell where things were dimensionally, but the individual themes of each level were executed exquisitely and help to develop the lacking storyline. There were even times when I got sucked in and started to tense up at the first sign of imminent death. The combat portion of Kyurinaga’s Revenge however is not as impressive as the platforming aspect. The special “combat levels” are set up as quick-time events, which seems out of place. Battling during the general levels is also weak. Kaoru and Broccoli Joe must be the worst vegetable ninjas of all time because they are extremely slow when it comes to battle. The amount of time that it takes Broccoli’s kunai to hit a target is both notably slow and frustrating. Both characters are also only allowed to carry three rounds of either bombs or kunai, which seems frustrating at times and redundant at others when the reload box is right next to the target mission. Kaoru, the onion, also tends to glitch a lot when moving boxes and he frequently “gets lazy” and just decides to give up while you’re trying to get him to move a box. After playing the single-player mode for a couple of hours, I enlisted my brother to play the two-player mode with me. Two-player mode turned out to be harder than singe-player simply because of the fact that if one of us died, we both had to start over. With a one-hit, instant death rule, it makes it difficult, to the point of annoyance, to move through levels. It would be great to have the ability to continue to a checkpoint after a player died and then being able to revive him there in order to keep the peace and avoid inevitable arguments between players. Another flaw is that it is hard to keep track of the players if you don’t move at the same pace. The cut screen follows the player in front but sometimes does not go as far is it needs to, which is extremely important for a platform game where you need to know what’s up ahead. I highly recommend playing with a controller as the keyboard controls are extremely awkward. While the main controls like walking or jumping are standard, I was contorting my fingers to press multiple keys at once for other moves such as shooting. I personally found the controller a lot easier to use, but struggled for way too long trying to get my controller to work. While RECO Technology boasts full controller support, I was unable to use a PS4 controller, even after an update to fix controller support, and could only use a PS3 controller after the update. Others were also commenting in the discussion board about how they could not use their Xbox controller, and if this could be fixed, it would be a great asset to playability. Overall, Kyurinaga’s Revenge is decent for its platform genre and provides interesting challenges and levels but is lacking in story and battling functions. Before I started playing I thought I would be slightly offended by a healthy spoof of Japanese culture. However, it began to grow on me. While I wouldn’t say Kyurinaga’s Revenge is top-notch, it is good for people that are simply looking for a platform game and don’t need any background whatsoever on why they are being chased by giant cauliflowers or attacked by a crazy cucumber overlord. In the end, I was even impressed by the accurate use of Japanese language and culture during dialogues, specifically regarding the names of the vegetables. However, if RECO Technology could fix some of the flaws listed, incorporated the story better, and improved battling modes, I believe Kyurinaga’s Revenge could be great.